Explore the most beautiful landscapes with an hiking experience from South to North Italy (from sea to mountains). 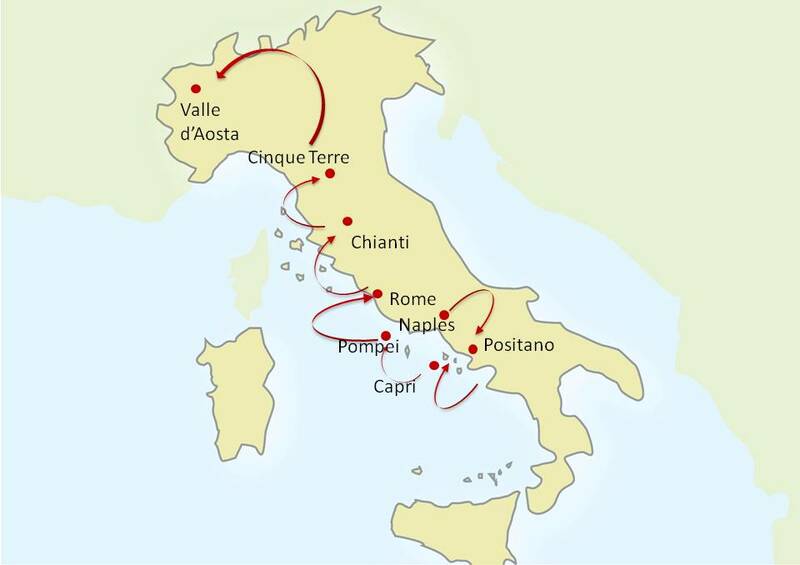 The tour features the beauties of the Amalfi Coast (Positano, Capri and Pompeii), the “Eternal City” Rome, Tuscany countryside and medieval towns (Chianti, Val d’Orcia, Lucca) and the smallest Italy’s region Valle D’Aosta. Discover the "Path of the Gods” and walk through the unique wild Mediterranean bush, coastal forests and caves suspended between the sky and the deep blue sea, have a walk in Trastervere, discover the typical products on Chianti Countryside, enjoy the bike tour in Lucca and have a two extraordinary hiking tours: Cinque Terre (5 miles of rocky coast) and Gran Paradiso National Park (universally famous for its rare and extraordinary fauna and flora) and don't forget to taste the amazing Italian food! 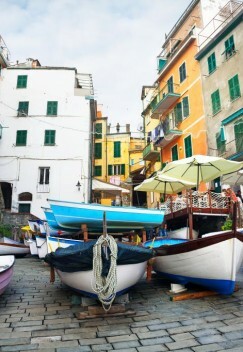 LIKE THIS ITALY PRIVATE TOUR? 9 Nights accommodation in exclusive and fascinating 4 stars sup. Hotels or Historical mansions, with full buffet breakfasts: 3 nights in Positano, 3 nights in Rome, 3 nights in Chianti, 3 nights in Manarola (Cinque Terre), 3 nights in Cogne (Valle d’Aosta). Private sightseeing Tours with local expert English speaking guides in Pompeii, Rome (Vatican Museums and St Peter’s Basilica) with preferential skip the line access. Private Trastevere Walking Guided Tour (about 3 hours), with local English speaking guide. Private bike tour of Lucca with English speaking local guide. Full day private excursion to the Island of Capri . Full day privates hiking excursions on the Path of Gods, in Chianti (pic-nic included), on Cinque Terre paths (Cinque Terre pass included) ,at Gran Paradiso National Park and in Cogne with locals experts English speaking guides. Pesto Cooking Course with tastings included in Manarola. 3 beautiful wineries visits and exceptional wine tastings: in Tuscany (one in Chianti and the other in Montepulciano) and on Mt. Vesuvius. 2 Lunches (in a Chianti winery and in Positano) and 2 typical Dinner Positano and Rome included. Cheese farm visit and local delicacies tasting included in Montepulciano. High speed train Naples – Rome- Florence: 1st class tickets with seats reservation. All private transfers by deluxe van with English speaking driver available for transfers and excursions for the entire Tour (including airport/train stations transfers). The tour begins in Naples and ends in Milan. Private Excursion with a local experienced hiking Guide along the “Path of Gods”, through very unique wild Mediterranean bush, coastal forests and caves suspended between the sky and the deep blue sea. Private guided visit of the Archaeological site of Pompeii. This city , before the eruption of Mt. Vesuvius in 79 A.D., was an important commercial centre. The fury of Mt. Vesuvius buried the entire area under a layer of burning ashes: thus, today, almost 2000 years later, we can rediscover the undisturbed city and life in those times. Private walking tour of Trastevere: you can feel the authentic roman atmosphere and discover the authentic artisan shops, the traditional cobblestones known as "Sanpietrini" and local shops. Typical Italian Dinner at a local chef’s home: You will enjoy for a few hours authentic local food, amazing company and unforgettable memories. Visit one of the most beautiful churches and museums in the world: St. Peter’s Cathedral, Vatican Museums and Sistine Chapel with the incredible Bernini Dome and the Michelangelo’s Pietà. Private tour in the cellar of a beautiful family run wine estate, where you will learn about the Chianti philosophy and wine making process. Guided tasting of 4/5 different red wines and Vin Santo (sweet wine) served during a delicious lunch in a beautiful estate villa. Don’t miss the small medieval village of Monteriggioni and Castellina in Chianti! Full day of walking excursion with professional guide to explore the countryside’s beauty and enjoy a pic-nic. Tasting experience in Val d’orcia: Brunello di Montalcino Winery and Cheese farm. Get ready for a extraordinary experience. Excursion in Lucca: a private bike tour is waiting for you! You’ll admire all the impressive city walls and the most important monuments of this medieval center (San Martino cathedral, Piazza Napoleone,The Guinigi tower and Piazza dell’Anfiteatro). Full day hiking along Cinque Terre: first stop is Monterosso al mare, the picturesque marina with its tall, narrow, colorful houses, the second one is Corniglia, the only village not directly on sea and Vernazza, the most picturesque of the villages, with small houses, alleyways and lodges ,the third is Manarola, the smallest village of the five, walk through the breathtaking “Trail of Love” and the last one is Riomaggiore. In Manarola you’ll attend a Pesto Cooking lesson with professional chef that will show you how to make the traditional pesto sauce, with the use of the mortar, explaining its ingredients and history. At the end you will taste your own job on a bruschetta (toasted bread) together with a glass of Cinque Terre wine. Aosta valley castle excursion: along the way you can choose to visit one or two gorgeous castles. The most renowned are: Castello di Fènis(recently restored and featuring rich frescoes), Castello di Verres (this castle does sentinel duty high on its rockyperch), Castello d’Issogne (more like a stately home than a real castle). Full day Hiking tour cross the Gran Paradiso National Park, universally famous for its rare and extraordinary fauna and flora, with local alpine guide. Raccommended excursion to Lillaz waterfalls which cover a drop of 150 metres in three long rocky falls.